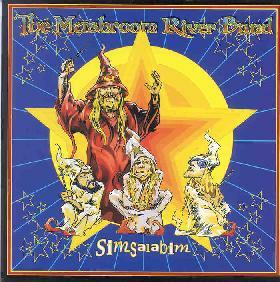 The Mushroom River Band - "Simsaiabim"
Hailing from Sweden, The Mushroom River Band play a brand of hard rock that draws a lot on 70's heavy metal with a little influence from contemporary stoner rock. They are not, however, as trippy sounding as their name might suggest. This is pretty straightforward, balls-to-the-wall rock, with lots of energy poured into it. The band works hard at creating a sound that echoes the past, but is firmly placed in the present. That goal is helped along by ex-Spiritual Beggars singer Christian "Spice" Sjöstrand's vocals, which stray more than a little into the realm of a more modern, aggressive alt-metal style. While the tunes are all well crafted rockers, with lots of great riffing from guitarist Anders Linusson, they tend to have a bit of that "samey" kind of feel to them. I would have liked a little more variety to the sound. The best of the bunch is My Vote is Blank, where Spice restrains himself to a more 70's sounding growl, and Linusson's guitar solo blazes away with a bright melodic edge. Also fun is The Big Sick Machine, with its catchy chorus and some rip roarin' harmonica courtesy of guest Janne Bengtsson. Both of these tracks are Spice penned tunes. Simsalabim should please fans of The Spiritual Beggars (especially their earlier stuff before they added a keyboardist to their line-up) and those who like their rock n' roll fast, heavy, and laden with riffs. For more information you can visit The Mushroom River Band web site at: http://www.riffrock.com/mushroom/. Simsaiabim is distributed by Meteor City. You can visit their web sit at: http://www.meteorcity.com/.